Franklin attended North Davidson High School in Welcome, North Carolina, and graduated in 2011. She then attended East Carolina University in Greenville, North Carolina. In her freshman year, her father was diagnosed with non-Hodgkins lymphoma, and Franklin became a stem cell donor, sending him into remission. In April of 2015 she composed a chamber opera entitled King Solomon which debuted with a sixteen-member cast and a twelve-member orchestra. Franklin won her first beauty competition during her junior year and was crowned Miss Black and Gold at a scholarship pageant sponsored by the East Carolina University chapter of Alpha Phi Alpha fraternity. She graduated with her Bachelor’s degree in Music Composition in 2015. Franklin then attended the University of North Carolina School of the Arts, obtaining her M.A. degree in Music Composition. She served as an ArtistCorps member from 2016 to 2017, teaching music to preschool and elementary school aged children. She also served as a music theory teacher and choir teacher for the Salvation Army Summer Music Conservatory in partnership with the Winston-Salem Symphony. Franklin competed in the Miss Thomasville, Ms. Capital City, and the Miss North Carolina pageants in 2016 and 2017, placing in the top five, if not the runner up, in all competitions. Franklin moved to New York City, New York, after being selected for the 2017 William R. Kenan fellowship with the Lincoln Center of the Performing Arts education division. She immediately began working with Success Academy Charter Schools, and founded a music club for the students. She also served as a cultural partner for Sing for Hope, a NYC based non-profit organization. In June 2018, Franklin competed as Miss Five Boroughs at the Miss New York pageant, winning the talent, interview and swimsuit competitions. She was crowned Miss New York on June 30, 2018, at Shea’s Theatre in Buffalo, New York. Franklin was crowned Miss America 2019 on September 9, 2018, by the former winner Cara Mund, of North Dakota. She is the first Miss America winner that did not have to wear a swimsuit as part of the pageant. She is the seventh Miss New York to win the title, the fourth Miss New York to win the title in the last six years, and one of three women that were not actually born in New York. In addition to the title, Franklin also won a $50,000 scholarship. 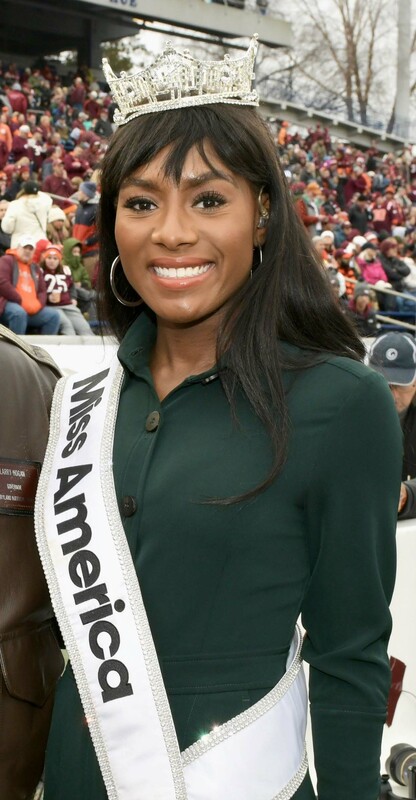 Natalie Stone, “Miss New York Nia Imani Franklin Crowned Miss America 2019”, People.com, September 9, 2018, https://people.com/tv/miss-america-2019-winner-nia-franklin/; Jenny Drabble, “Winston-Salem native Nia Franklin wins Miss America pageant”, Journalnow.com, September 9, 2018, https://www.journalnow.com/news/local/winston-salem-native-nia-franklin-wins-miss-america-pageant/article_afbf06c8-7ea2-5eaa-b8dc-b9350faafdf6.html; Wayne Perry, “Former County Resident Wins Miss America Title”, the-dispatch.com, September 10, 2018, https://www.the-dispatch.com/news/20180910/former-county-resident-wins-miss-america-title.